Peace, real peace begins inside. Peace starts with you. As we become open to this realisation, it allows an invitation for peace to enter and renew our lives. The changes we so desperately long to see in the world around us must already be happening inside us. As we wake up in consciousness to peace, we become a peace-giver to our own world and peacemakers for the world at large. Seeing peace. 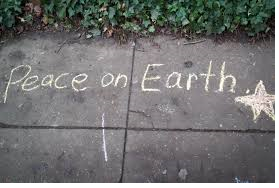 Seek to see peace through lenses of peace, re-viewing each person as part of the global family of Life, the life of God, the Christ, the soul’s peace, thus creating peace for all. So, step away from the noise of separation and not-enoughness, let go of fear and thoughts of pending dooms. Now, Turn inside, and with peace eyes, behold the vast domain of peacefulness! it is off the chain! Plunge into the peace, lose your worry, disappointments and strivings for, let go regrets and mental garbage, and anything that may be blocking out the light of peace. Create peace. We do not create peace by simply wishing for peace. How do we create peace? We must ‘be aware’ that we came here embedded with a peace code. Peace, is man’s birthright, the right trajectory and purpose of the soul.